Please feel free to download the content below. We like to share information from our partners, influencers, and thought-leaders that help drive adoption and empower end users. We hope you find these items useful. The healthcare provider decided to overhaul its internal information hub platform from an on-premises version of Microsoft SharePoint 2010 to Microsoft SharePoint Online, leveraging Office 365 and Azure. Download the case study to learn how Content Panda reduced the number of SharePoint support tickets submitted to the internal help desk as well as the cost and time needed to create in-house training programs. A local government agency was in the beginning stages of rolling out Office 365 across all of its departments. Since its IT teams did not have deep knowledge of Office 365, the local government agency sought a third-party training expert that could deliver the fastest, most cost-effective option. Read this case study to learn how Content Panda deployed Office 365 training in less than 2 hours. While in the process of upgrading from SharePoint 2010 to SharePoint 2013, a global science and engineering firm sought out third-party training alternatives for its overburdened IT team. Read this case study to learn how Content Panda reduced help desk tickets by 77%. In this eBook, we will explore in detail why SharePoint implementations have failed and provide a blueprint with four specific steps you should take to ensure you don’t migrate to SharePoint in vain. In this new eBook, we’ll give you the four steps to ensure your change management project for Microsoft SharePoint is a success. This white paper will take you through the SharePoint adoption checklist you need to make sure your SharePoint deployment is successful. In this white paper we break down the SharePoint adoption journey into four phases: discover, plan, engage, and measure. 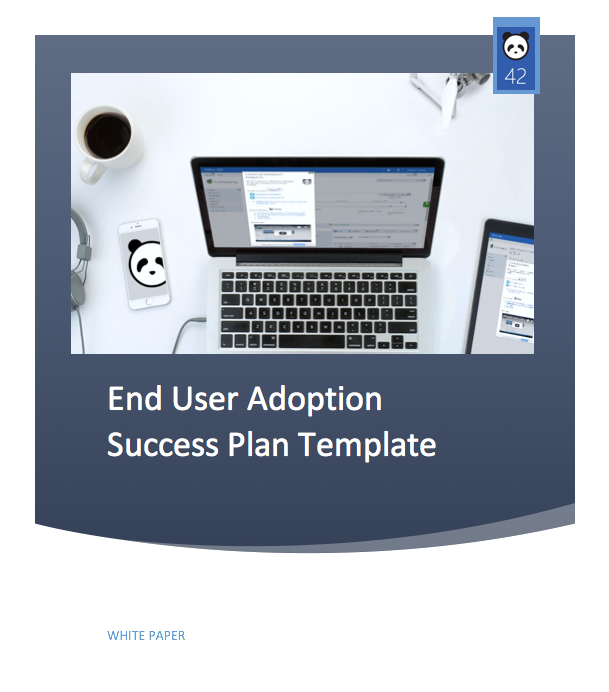 This user adoption success plan template follows the methodology from our CMO, Heather Newman’s regular talks on end user adoption in the SharePoint Community. It is to be used along with the Content Panda for SharePoint End User Adoption Guidance white paper. 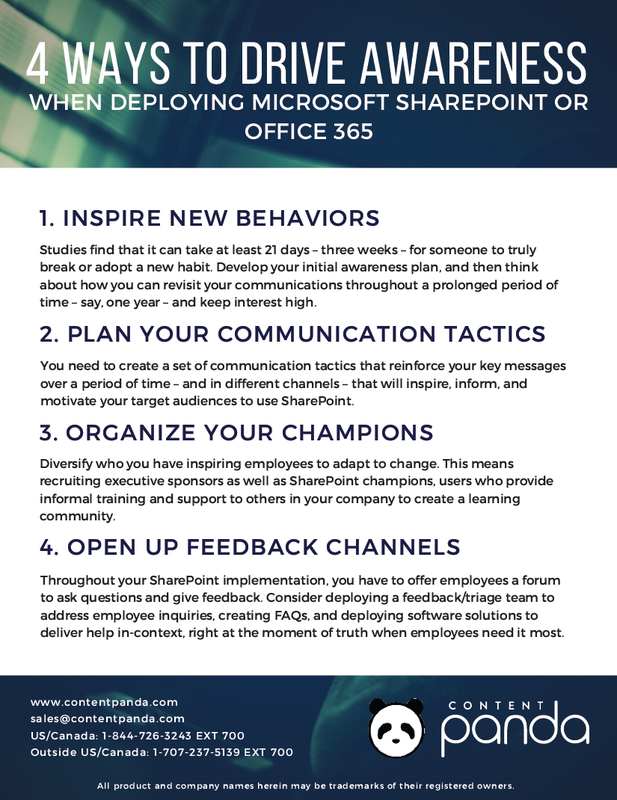 Awareness must happen before, during, and even after your Microsoft SharePoint or Office 365 rollout. Learn the four ways to drive awareness in this download. It’s vital that before you even begin training new users on how to use SharePoint, you make it clear to them when, how, and why you need to use the platform. Learn the five steps to build a governance plan in this download. Everyone learns differently, and any training strategy must take this into account. Before you decide which mix of training is right for you, you need to have a training plan in place. Learn the five points you must include to ensure your training is successful in this download. In this comprehensive report, AIIM looks at the perceptions of SharePoint and SharePoint 2016, business drivers, technology infrastructure, benefits, technical requirements, and purchase and spend plans of responding organizations. The report concludes with a summation and recommendations organizations can apply to their business, based on the survey findings. This survey report takes an in-depth look at deployment progress, distractions and issues, consolidation, integration, enhancement with add-on products, and future strategies for all-round information governance. As well as a look at the threat from cloud collaboration systems, mobile clients and hybrid models. This report looks at how different ECM system strategies match the overall goals of the information management lifecycle, and the governance and adoption issues that users face, particularly when extending access to mobile and the new cloud services. 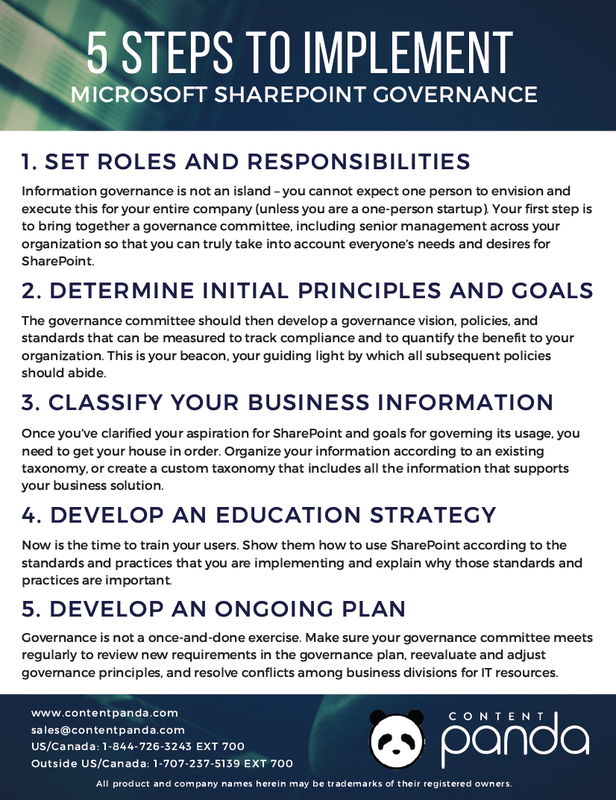 Having a social governance policy is an important part of your end user adoption program and overall governance planning for your SharePoint environment. This paper will focus on three key areas in order to best apply social governance to your existing or new environment and remove the stigma from the word "social" for your management teams.